Tablet sales fell to 31.7 million in the first quarter of 2018, an 11.7 percent decrease compared to the same period in 2017, according to a new report from International Data Corp. (IDC). Detachable tablets were a bright spot in the category, showing a year-over-year improvement of 2.9 percent and a 15.3 percent market share. Sales of traditional tablets, on the other hand, were down more than the market overall, having fallen 13.9 percent below sales for 2017's first quarter. One major development in the market is Google's formal launch of Chrome OS into the tablet space. "Chrome OS's entrance in the detachable market is a welcome change as Google is finally a serious contender from a platform perspective," said Jitesh Ubrani, senior research analyst with IDC's Worldwide Quarterly Mobile Device Trackers, in a prepared statement. "Google's tighter control and integration of Chrome OS will allow brands to focus more on hardware design and additional services rather than spending resources reconfiguring Android to work in a detachable setting. Combined with Microsoft's efforts to run Windows on ARM, the detachable market is poised for strong growth in the near term." "The timing of Chrome OS' official entry into the tablet category is apt," added Linn Huang, research director for devices and displays at IDC, in a news release. "Peak education buying season is approaching, and Chrome OS has resonated with administrators for its manageability where deployment is strong. 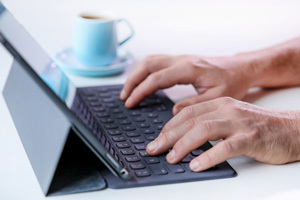 Schools looking for that same environment but in tablet form — generally students aren't provisioned a device with a keyboard until older — could find favor with these new devices." Apple led the market with 9.1 million sales and a 28.8 percent market share, up from 8.9 million units and 24.9 percent of the market for the same period last year. Among Apple's tablet sales, "1.8 million were iPad Pro tablets, making Apple the leader in the detachable market as well," according to information released by IDC. "Apple's latest iPad launched towards the end of the quarter and along with the company's renewed focus on the education market should prove to be quite lucrative in the coming quarters." Samsung held the second spot and even maintained a consistent market share of 16.7 percent, despite a drop in shipments from 6 million in the first quarter of last year to just 5.3 million in this year's first quarter. "Samsung maintained the second position although the company's shipments declined 11.4 percent compared to last year," according to IDC. "Samsung is one of the few remaining brands to offer premium Android tablets with its Tab S lineup. However, barring any significant changes, maintaining its position in the premium space may prove challenging as detachables based on the Apple, Microsoft, and even Google Chrome platforms pick up steam. Towards the end of the quarter, Samsung announced a new enterprise-focused tablet, the Tab Active 2, and while this is a niche market, it tends to be one with high margins." Huawei took the third spot and 10 percent of the market with 3.2 million sales, up from its 7.8 percent share and 2.8 million sales during last year's first quarter. "Huawei grew 13 percent year over year, gained more than 2 percent of share sequentially and climbed back into the ranks of the top three," according to information released by IDC. "Huawei is still geographically anchored in Asia/Pacific (excluding Japan) — 49.5 percent of their shipments went to this region — but it saw tremendous growth particularly in Europe where its volumes grew 72.7 percent against the backdrop of an 8.7 percent total market decline." Lenovo managed to improve its market share from 5.8 percent to 6.6 percent simply by holding steady and selling the same number of tablets, 2.1 million, during the most recent quarter as in last year's first quarter. "Lenovo managed to grow 1.8 percent compared to the past year with most of the growth stemming from its detachable portfolio as the company shipped over 200,000 detachables," according to a news release. "The company's strong presence in Asia and Europe has helped cement its position amongst the top five and helped differentiate it from close competitors like Huawei." Amazon rounded out the top five with 1.1 million shipments and a 3.5 percent share of the market. That's well below the company's 2.2 million sales during the same period last year when it held 6 percent of the market. The company "slipped into fifth place, though this does not come as a surprise as the company's tablet shipments are highly seasonal," according to IDC. "Moreover, during the first quarter, the company was far more focused on enhancing the Alexa platform and even announced availability of its voice assistant on the smaller 7- and 8-inch Fire tablets."